The word ‘digital’ has copped a bashing for being the worst word in the industry, and now Salesforce reckons ‘digital marketing’ is set to follow suit in redundant vocabulary. In Salesforce’s third annual State of Marketing report on the current landscape, digital is becoming ubiquitous in marketing, to the point where 97 per cent of market leaders plan to increase or maintain their level of digital spending. And by 2021 marketing leaders are going to be spending 75 per cent of their budget in digital channels. Which means spend in traditional channels will inevitably drop down to a quarter share of the budget. Unsurprisingly, social media is gaining much of the budget allocation, with 67 per cent of marketers planning on increasing their social media marketing and engagement with 65 per cent looking to advertise on social platforms. Keeping the customer at the forefront of every strategy is the winning tool from the top performing teams. “If we truly put customers at the centre of our thinking — considering how we can make any touchpoint delightful — it changes the way we approach applying all the tools available to us as marketers,” said Salesforce CEO Scott McCorkle. At any conference nowadays there’s no shortage of execs stressing the importance of keeping the customer at the heart of everything a brand does. And it turns out the top performing marketing teams are the ones that have their customer journeys figured out. While many marketers do pay attention to the customer journeys, it’s the ones who realise it’s an ongoing pursuit and integrate it into everything the brand touches that are rising above. 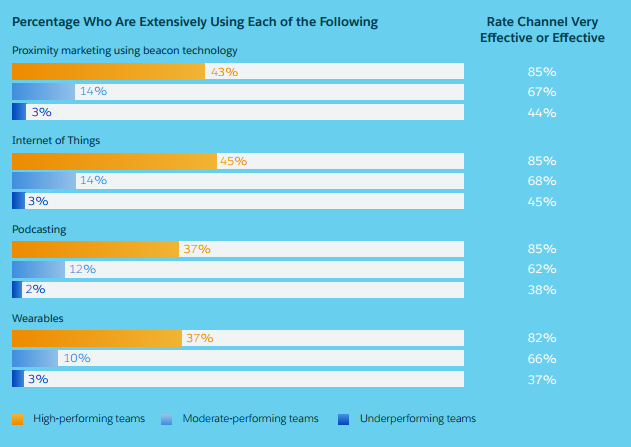 Tech adoption is widespread among the high performing marketing teams too, with 63 per cent of marketers intending to increase their ad tech in the coming two years, particularly among the internet of things, beacons, podcasts and wearables. And it’s usually the marketers that jump at the chance to try new things that are the ones winning in the tech space. But you can’t do all this without a solid team and executive endorsement – a commonality Salesforce picked up in the report among the high performing teams. “Some 83 per cent of high-performing marketers have the executive team’s complete commitment to their marketing strategy,” the report noted. Which media channels are working? 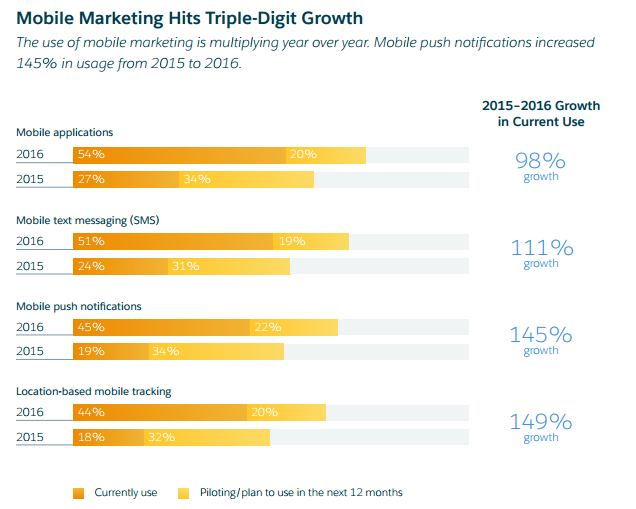 It probably comes as no surprise that mobile is one of the key priorities and performers for the top marketing teams, which includes social media and email marketing. Some 82 per cent of marketers now agree social advertising is core to their business. It used to only be 27 per cent of respondents who thought social advertising would generate ROI, but in this report that number has increased to 75 per cent. If you’re keen on becoming a marketer others look up to, download the full report from Salesforce here.